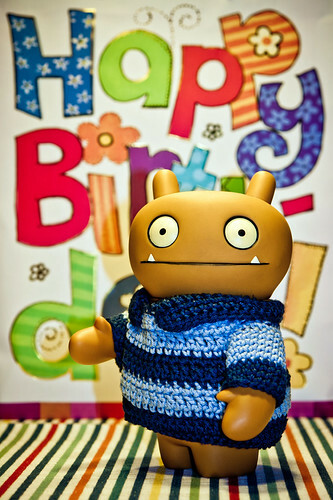 Uglyworld #1480 - Happy Birthdays (Project TW - Image 79-366), a photo by www.bazpics.com on Flickr. Todays is anothers super specialers day here in the cookie cave, as this mornings when the clock passereds midnighters it turneds into Mireille's birthdays, and nots just any olders birthdays, she gots to be thirty years olders!!! Baz tellers me that it's normallers to celemabrates milestoners birthdays, just as 30's and 40's, buts I keepereds makerings jokes that for the firsters time since Baz and Mireille gettereds togethers they is both playerings in the sames league, ha ha. It won't be longs until we is celemabratings Baz's fortys years, holy craps, it's hards enough trying to counters that highs! Buts back to the subjecters in hands, behinds me is a super coolers bag full of presenters for Mireille to enjoys this evening on what remainers of her birthdays!